When your young and at your first dance, and your sitting on a small gilt chair with your eyes lowered, terrified that you'll be a wall flower. Suddenly, you see two black shoes, a white waist coat, a face, it speaks. -Anna (The King and I)- Shall we dance? On a bright cloud of music shall we fly? Shall we dance? The King and I is one of my favorite movies and while I love the remake starring Jodie Foster the original version starring Yul Brynner and Deborah Kerr remains my favorite version. The scene where he asks her to dance is one of my favorite. I have never donned a ball gown nor slipped my foot into a fancy dancing slipper but I always imagined those were my feet tripping across the floor to the lively tune of Shall We Dance. 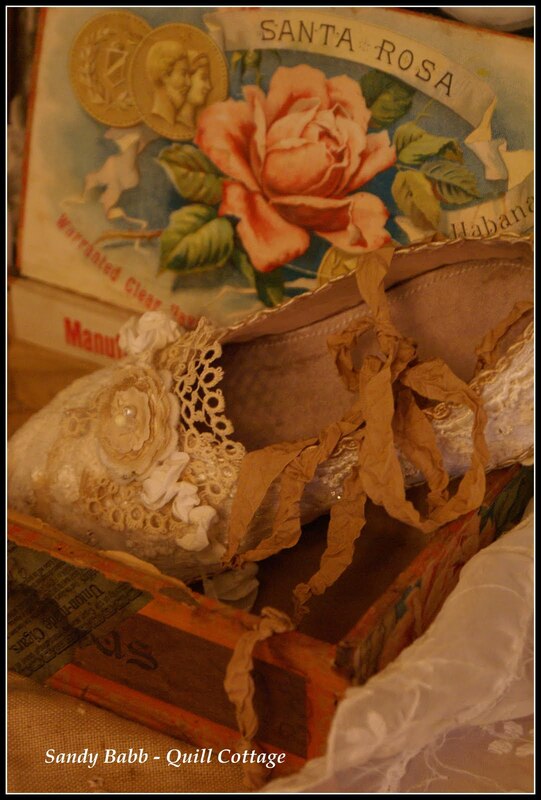 Having recently watched The King and I while sick I was inspired by the dance scene and imagined my own version of a dancing slipper that Anna might have worn to dance with her king. This soft sculpted fabric collage shoe is my latest piece of artwork. 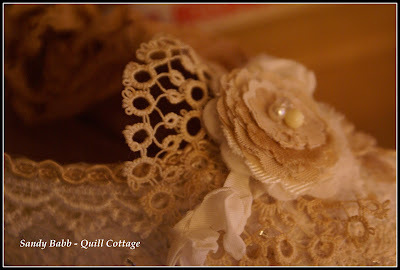 I have begun working in a series exploring making sculpted fabric collage pieces. The demitasse cup and saucer from my last post was my first experiment and this dancing slipper, which is completely handmade, is my second. 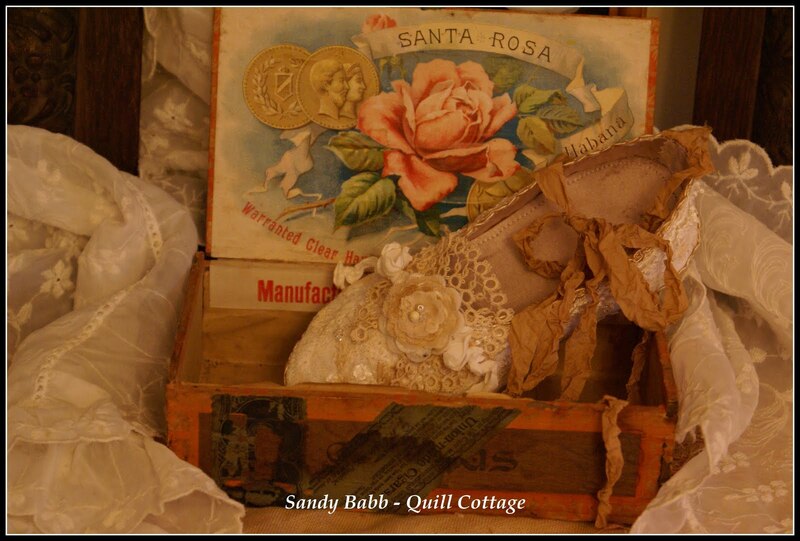 My daughter said if she had not seen me make it in stages she would have sworn it was a real shoe! Thank you all so much for the sweet well wishes and prayers for my mother and myself. I am still battling a nasty cold and my mother, well, the situation is not good. We are trying to wade through the proper medical channels to get a correct diagnosis and if our suspicions are true we have some long and difficult days ahead. I so appreciate all your thoughts and prayers. On a brighter note, speaking of new romance as in the song above, romance is afoot here at the Quill. The young man who comes to call on Darling Daughter asked her to be his bride and to dance through life at his side!!! We are beyond excited and wedding bells will be chiming in June! I hope your day is a bright cloud of music upon which you too fly! I hope you can get a diagnosis for your mom soon. And what exciting news a wedding. Beautiful shoe! and gorgeous pics. I too hope you get a diagnosis soon for your Mom. 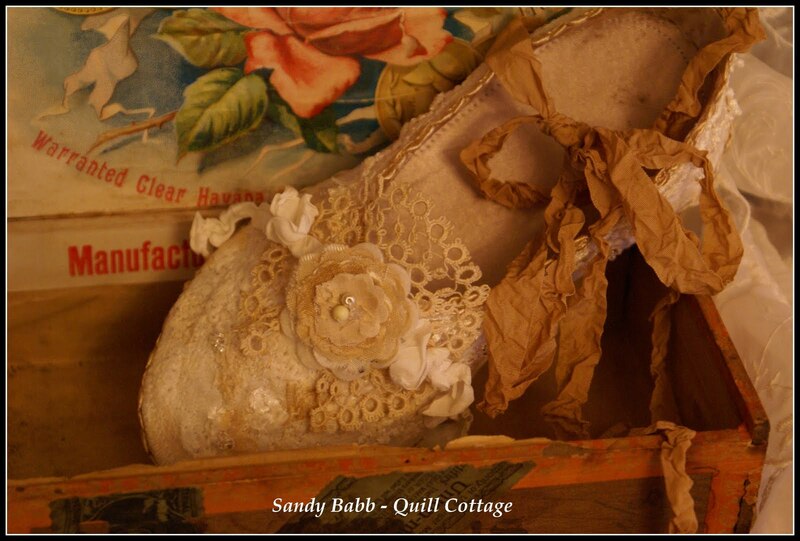 Your collage pieces are simply stunning and they do look as if they are the "real" thing! Congrats on your daughter's upcoming wedding!! Have a wonderfully creative day. I'm so sorry about your Mom. My mother is very frail and declining rapidly, so I understand your fears and worries. And lastly, I love The King and I, as well. I've been in it twice, once playing Lady Thiang, and once playing Anna. This was many years ago! Still, to the day, no matter what other roles I played in my many years as an actress, my father always said "You know I liked you best in The King and I." Makes me smile. The shoe is absolutely gorgeous. Sigh... I think I could be Cinderella with that shoe! Sending sunshine your way, Sandy! And congrats to the bride! A Wedding in June- oh joy! Your shoe creation is beautiful. I too hope you get a diagnosis soon for your mom. You both are in my prayers. I cannot believe you made the slipper!! You have so much talent Sandy, you amaze me everytime. The slipper is just beautiful. I love that movie too (older version)but I have a soft spot for the older movies. I am so sorry to hear that your Mother and you are ill.I am praying for you both, dear friend. 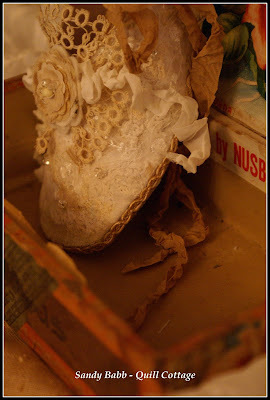 Thank you for sharing your precious slipper and other news with us. Please take care of yourself. Many blessings of good health are being sent your way. I've been through this with my mother and my in-laws. I know how difficult it is. My sympathies are with you. Your shoe collage is just beautiful. 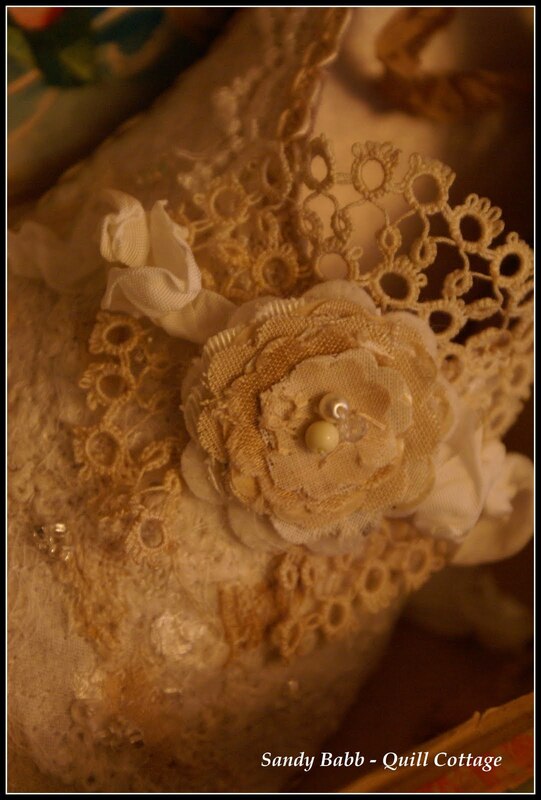 So delicate and lacey. MY goodness, I would of thought your shoe was real. I love it so much, what a fantastic job. Amazing, so lovely. And i remember the song from the king and I. I took my little brother and Sister to the movie. I loved the big skirts on the dresses she wore. Life has such wide swings...concern for your mother on the one hand and great joy for your daughter. All the very best to the happy couple and I'm so excited, too, because I know that you'll document it all so very well. Now I'm humming this song and John will probably wish to wring my neck. I'll blame you, of course. I love the original version, too. Your blog always offers a beautiful visit. So wishing that things will go well for your Mother and I know there is much excitement in store for you and your daughter. 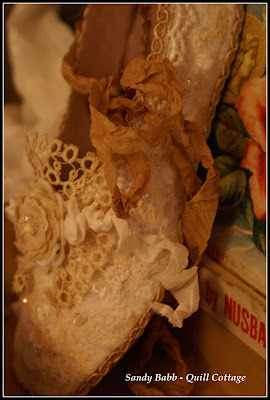 If i were cinderella I would prefer your shoe instead of the glass slipper. You made it look fantasic like usual. I hope you can get a diagnosis for your mom soon. I am sending happy thoughts your way! Well the shoe certainly fits my taste! 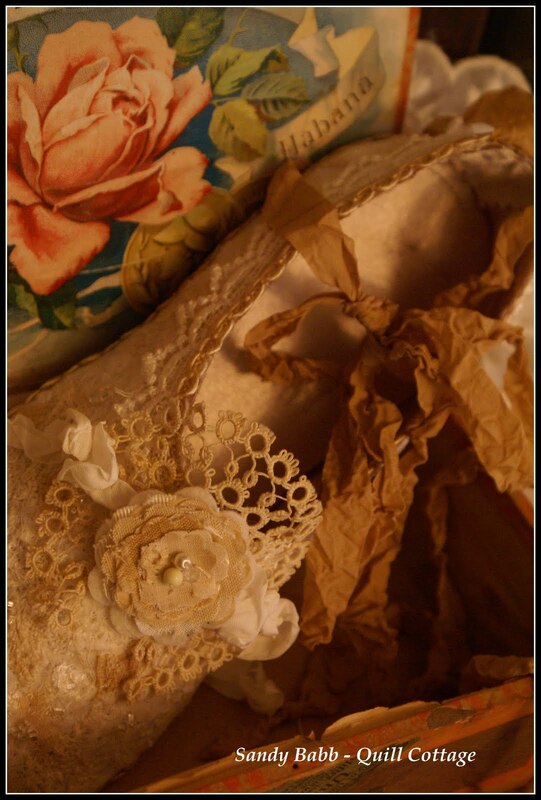 i love the lace, it is so very elegant..gorgeous...a wonderful creation! I am your newest follower..and I just wanted to congratulate your Somerset 'exposure' for that is where i found you! Come by and visit with me anytime. I crochet and make tea cup sculptures too...we'll have a blast sharing our creative worlds! So sorry to hear about you mom Sandy - I hope you get it all solved and soon get a diagnose. Congrat with you daughter and the upcoming wedding - how wonderful. Love you shoe project- it´s so pretty and wonderful. Ok, this is beautiful and that's all there is to it. Love the colors and the textures in combination with the soft style of it. Great piece! Just stunning! I'm beyond words. My hands would not allow me the nimbleness of working the threads as you do! Or maybe it's the brain behind the hands that I have trouble with! Ha! But congratulations and the very warmest blessings to the engaged couple! I am keeping your dear mother in prayer my friend. I must say the original King and I all the way for me as well. The slipper~ well it is fit for a princess. Oh Sandy This Is Lovely! 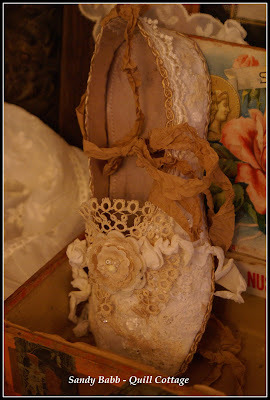 Truly a Slipper made for a Princess or Queen!I Love the King and I as well. A Wonderful Movie. I hope this finds you Getting Well and You and Your Dear Mother will be in my Prayers. congratulations with your daughter, may she live happily in her new (june) life. As for your mother, it makes me very sorry for all of you, I hope they can soon start treating her, medically. 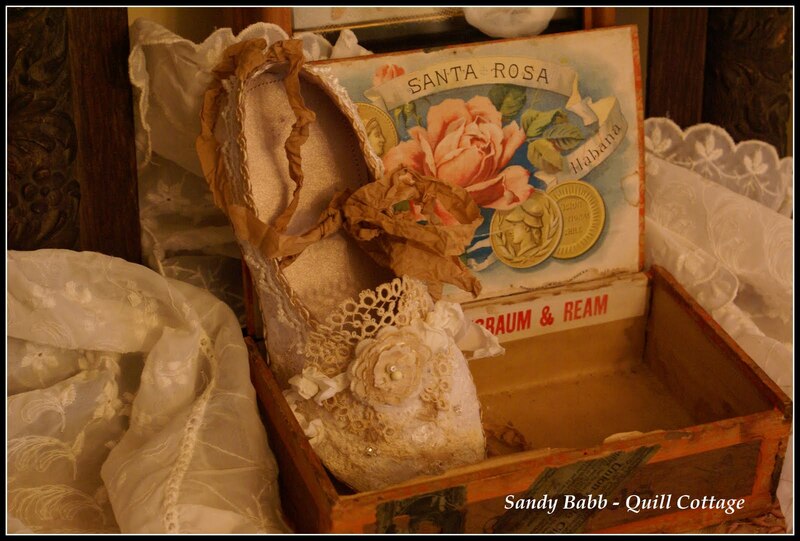 And you, dear friend,-you are a so amazingly creator, -this shoe is surely a fairytale shoe, and so beautifully made- and so wonderfull presented, Sandy. Sandy, I haven't been reading blogs much this past week, have been so busy myself and am sorry to read that your mother's health may be worse than you thought. Please know that my heart is heavy for you. And the shoes...truly...you made them? I thought they were purchased shoes you had decorated! Making 3D items is NOT easy! Nor were the boxes! The boxes...fiddly work until the decorating of them begins! But the shoe in this post...oh my! Exquisite! Inspiring! If you sell them, they will fly!